Site 64 is located just steps away from the clubhouse and marina. 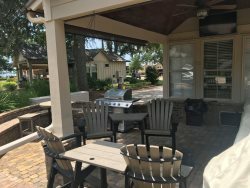 With comfortable patio furniture and TV available this site makes a perfect escape! Backing up to our east fence you will be offered private water views. This is a perfect getaway-from-it-all site! Grill- Covered and we ask that it is covered after use.